We're officially in the "close to Halloween" part of the year, guys. Which means it's time to get serious about planning a costume. It's always fun to take recent news items and turn them into costumes, so may I suggest taking the Apple Announcement spectacle and leveraging it to reach your Halloween glory this year? Yep, we're talking about a totally rad rose gold iPhone costume. This is one for the cool nerds who also have a penchant for crafting, and I know there are plenty of you out there. (I'm looking at most of my friends and family. You know who you are.) This is also an incredibly cute costume to make for young kids (and also a tad easier, because you get to use smaller materials). Okay let's get to it! This costume, like so many amazing costumes, has a sandwich board construction as its foundation. Thankfully, all this requires is some cardboard, a pencil, scissors, and some thin rope. Start out by cutting two holes near both corners at the top of both pieces of cardboard, so you can loop the rope through and keep it on your shoulders. 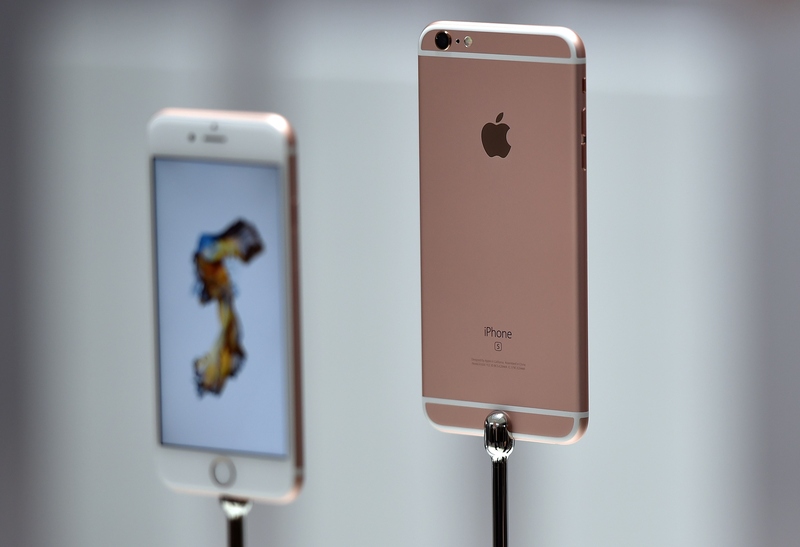 The coolest thing about the new iPhone in terms of aesthetics is the rose gold color option. It's classy as hell. All you'll need to get your phone costume sparkling is some rose gold spray paint (and a well-ventilated area in which to spray). Most likely, you won't find a craft-suitable spray paint that's called rose gold, so opt for copper (the two colors are pretty much the same). Cover one entire side of each piece of cardboard to make the outward facing portion of the costume shiny and very iPhone-esque. You can order a can o' spray paint for about $15 on Amazon. You can get as creative has you have patience for with this part. Before you put apps on the front of the phone's screen, you'll want to have a background, because nobody's home screen looks like corrugated cardboard. Personally, I'd save myself some time by just painting the home screen area black, but you can use wrapping paper, hand-painted designs, or patterned contact paper (I think these polka dots are cute!) to use as the backdrop for the next step. Sketch out a large vertical rectangle to indicate the area that you will make into the screen of the phone. Measure out the screen area, use the xacto knife to cut the contact paper to size, then slap it right on the gold side of one of the boards. Voila! You have the front side of your costume! Of course, no iPhone — not even a costume version — is complete without your favorite apps. To get the app icons, run an image search for "iPhone app icon images" and find the apps you want to include. A good print size for the apps (so that they look proportionate on your costume) will be 3 inches by 3 inches, but you may have to play with sizing a bit, depending on the size of your sandwich board. Sketch out the size that seems right onto your "home screen," and print according to the measurements of the sketch. Once you've printed out your icons, place them on the home screen using Mod Podge. If you don't want to go all-out and cover your screen in apps, just go for the minimalist home screen angle (like my phone above. I know, I'm super boring). Also, if you know you're one of those people who have a million unread emails, then for the little red notification circle and with white paint, draw an obscene number. It will crack your friends up. Now to add the little details that make the costume sing "iPhone!" Using black paint, add the home button at the bottom of the phone, a thin line at the top for the audio, and 2 dots for the camera and the flash (one above the audio and one just to the left of it). If you're feeling really ambitious and have a steady hand, you can use white paint to create the service, time, and battery information on the top of the home screen portion. Another option would be to print out images of the top info bar of an iPhone using a screencap of your own phone, and affix the images using Mod Podge (miracle product)! You'll also want to add the camera on the back of the phone as well. Easy peasy! If you just can't stop and want to continue to add extra dazzle to your costume, then there are a couple of other super easy things you can do. One of them is to make sure you wear ear buds to your Halloween soiree. The other is adding pizzazz to your phone, such as giant stickers (Hello Kitty FTW) and jewels and other such sparkly sundries that many are fond of placing on their phone. Just go all out. Halloween only comes once a year, after all!